Still, that Stairway solo brings tears to the eyes. Again, another show best appreciated through the audience recording, the sloppy, lackluster performance really shows through on the 'soundboard' (actually video feed) recording. Seattle is probably most notable for featuring John Bonham's last drum solo. Now that the film is available and synced up on youtube, this show takes on a really enjoyable vibe. Zep is feeling loose and, though robert says he can't hear out of one ear for half the show, you see a band that loves to play, is having a good time, and really enjoys being THERE in Seattle. Sick again is what it is, and it's supposed to be sick. Page often wanders around in that solo, and it always feels like a warm up song. Over the Hills was good, and Page is in experimental mood on this evening, which is the main reason to listen to this show. Jones is goofing around during Battle of Evermore, singing it like a cheezy jazz club singer might. 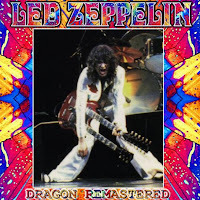 Bonham is solid throughout, and the drum solo is an incredible adventure. No Quarter is the piece de resistance. Once they get through the boogie woogie (which I'm not partial too either, but they also did in LA on this tour), Page goes to work and slowly builds a great piece of dissonant jazz that's far out of context any typical guitar playing. In the video you can really see he's getting the noise he wants, and this is Jimmy at his best and most experimental, despite the sleeping sickness Plant mentions. It also clears up the hearing in Plant's ear! From that point, I'm hooked and he can do no wrong. This is a great show for all the non-technical reasons Zep is the greatest band to ever walk this earth. This show was a good, good time, and the looseness of it all sets the spirit of the band spilling over the top.